As long-time readers know, I love time-boxing tricks: POWER HOUR, 4 day work week, 7 day product. Working within artificial constraints can make things easier on you and simpler for your users/customers. The author recommends writing all your features on a piece of paper, then starting the clock. You have 60 seconds to draw a line through the features you don’t absolutely need. If there’s any doubt, cross it out. The 60 second deadline is a great method to trim to the barest essentials. The first law of Simplicity is to reduce. What happens to all those crossed out features? They go on the “nice to have” list. Maybe you’ll get to them later. For most, you will likely realize they weren’t really that nice-to-have. What the book is describing is the 80/20 rule, or Pareto Principle. It says the first 80% of functionality can be built with 20% of the time it would take to finish the entire application. 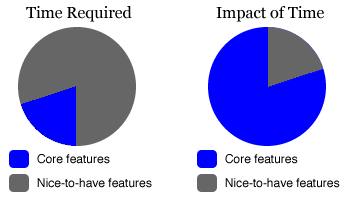 That leaves 80% of your time to finish those few pesky 20% of features… the ones that will be used least by the fewest people and may only add more complexity to your core feature set. That isn’t worth it. How do you determine what is or isn’t important? What do you think about asking users to do the crossing out? Share your thoughts below and I may be able to share an autographed copy of Designing the Obvious with you. I’ll be randomly picking three people from everyone who commented during my series.